We have been in the business of providing Guard Tour and Workforce Management solutions for over 30 years. Our experienced team of professionals is highly knowledgeable, and familiar with the requirements of the industry. At TourTrax, we fully understand the mission-critical importance of reliable and accurate data collection, and diligently work to ensure that the software and hardware products we sell are durable and meet exceptionally high standards. Monitor and track staff movements in real-time as they conduct patrols, location visits, and inspections. See where they've been, when they've been, where they currently are, what incidents they've reported, and be alerted to areas that have been missed, allowing Supervisors and Management to take corrective action. Use collected data as verified proof of presence to resolve disputes and liability issues, and conduct staff performance evaluations. ​Ensure the safety of workers engaged in solitary activities in potentially hazardous situations with our portable lone worker monitoring devices and built-in Mobile App functionality. 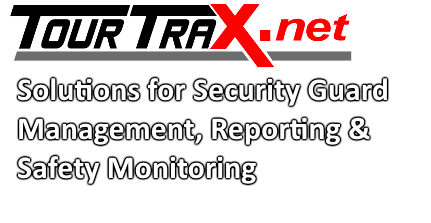 With many Time and Attendance features such as time sheets, Site sign-in, check-calls, and inactivity monitoring, TourTrax can help with the monitoring and management of Worker's time. An Android Device that works in real-time to help manage and monitor your patrol officers! A durable wand that is easy to carry, has a long battery life and provides the proof-of-presence needed! A portable device capable of real-time communication, performing small tasks and SOS! A very durable device, with a long lasting battery, making it a great choice for monitoring patrols!